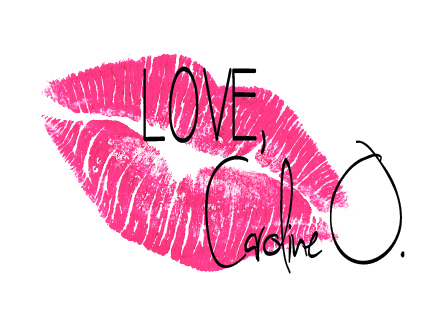 Modern Vampire - Love, Caroline O.
It’s no secret that Vampire Weekend, the band of frat-boy-dressed Ivy League hotties, is my favorite band of all time in the history of ever. The newest album of the band’s trilogy, Modern Vampires of the City, has been out since may 14th but I've let the songs (blast on full volume and) resonante in my mind, until now. 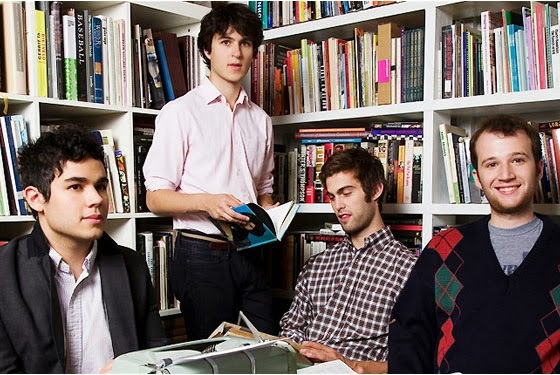 For those of you who have been living under a rock, the indie-rock group Vampire Weekend is composed of four former Columbia students who used to perform in dormitories around their alma mater. True to their image, the Vampires have remained the ultimate college band, providing modern and African tunes to university fans nationwide with songs titled “Oxford Comma” and “Campus.” Vampire Weekend’s catchy sounds don’t stand alone. The unique lyrics, written by guitarist and lead singer Ezra Koening, always provide a deeper meaning and never disappoint the music intellect, even in songs like “Ya Hey” and “Holiday.” The Vampires don’t hide their influences either. From poets to rap artists, the band has been weaving together a sound that is a collection of many different sources. Unlike Vampire Weekend’s first two children (their self-titled album and Contra), the sleeve, the colors, and even the font of the new album promises a new angle to the band’s mix of Beach Boy’s inspired beats and afro sounds, but does it deliver? Before listening to the album in its entirety, I’d already heard a dozen or so reviews from friends telling me that the band had really gone “mainstream” (for a lack of a better word). This gave me more incentive to buy the album. To my surprise, Modern Vampires of the City was on the shelf for only 5 days, and it was conveniently priced at $9.99 (Target.com). Do these vampires know what it’s like to be a broke college student or what? Ever since I tore open the CD almost 4 months ago, I have blasted the 12 tracks over and over in their perfectly orchestrated order, blabbed on Tech’s 88.1 (KTXTfm.org) about the Vampire Weekend’s success, and promised “Unbelievers” that Modern Vampires of the City is hands down the best album of 2013. 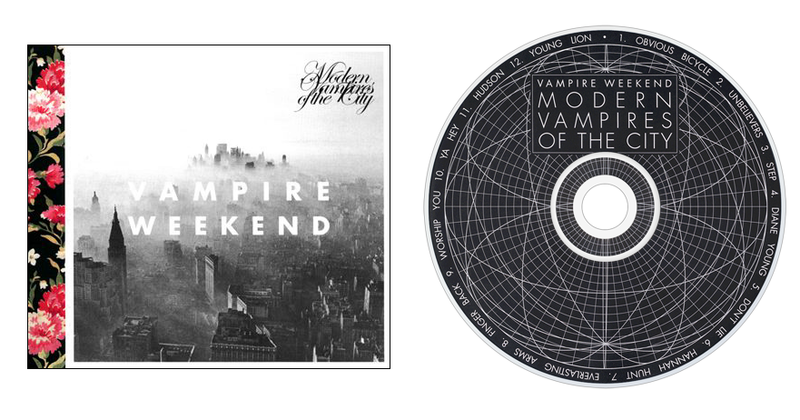 Modern Vampires of the City did not stray away from their roots, let alone feel “mainstream.” In fact, Vampire fans can expect the same distinctive music that caught their attention in the first place, even though cover art of MVOTC says otherwise. The black and white image of a muggy New York is defiantly a change from the washed out yellows and pastels that dominate the cover art of the first two albums. It suggests a “dark,” more mature version of the Vampires we love, but I don’t see it that way. Most of the tracks have a sing-along feel. From tempo-altered words to long licks of vowel sounds, you won’t be able to look up what Koening is singing, you’ll just have to enjoy the moment with him. Other songs like “Ya Hey” will make you wonder who is squealing in the background and just how to make that noise. It’s fun, it’s memorable, it’s that new found love for Vampire Weekend all over again. I am particularly fond of “Step,” and I’m sure many Vampire fans can agree. The song encompasses all the aspects that make the band exceptional. Remember the hit “Holiday” when the Vampires dressed up like Victorian lords and jumped around L.A.? Well the wig-wearing royals incorporated their love of 18th century sounds in “Step” by using harpsichords (a synthetic string instrument) and a magical chorus, while never forgetting the electronic core that drives them. The track begins with a tongue twister rap: “Back back way back I used to front like Angkor Wat, Mechanicsburg, Anchorage and Dar es Salaam,” which are locations that range from religious temples to cities in Africa. Koening continues by paying homage to New York, home to the members of the band. But what does the rest of the lyrics mean? “The gloves are off, the wisdom teeth are out/ What you on about?/ I feel it in my bones, I feel it in my bones/ I'm stronger now, I'm ready for the house/ Such a modest mouse,/ I can't do it alone, I can't do it alone.” Honestly? I refuse to research the band’s intentional meaning for this particular song. I have my own thoughts, but everyone should enjoy the slow beauty of “Step” with their own lyrical analysis. 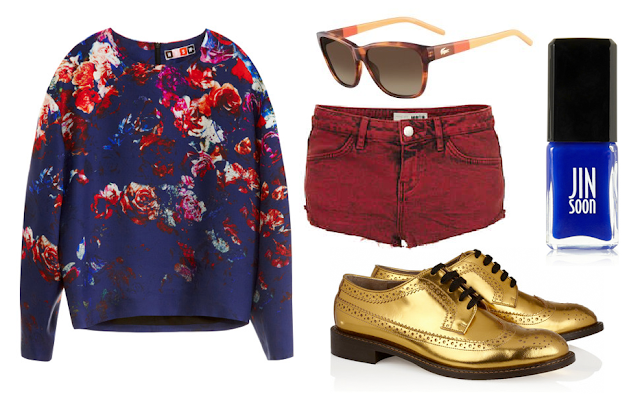 You know I just had to post an outfit dedicated to Vampire Weekend and what they inspire. Enjoy!